This photo is from a Globe and Mail article on Oliver Parsons- Baker who, it's hard to tell, is dressed as a giant turd in order to bring attention to the plight of people without clean water. 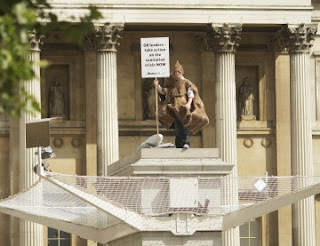 He's one of many Trafalgar Square Plinthers who mix art and activism. His sign says, "G8 leaders - take action on the sanitation crisis NOW." When we're talking about people getting sick from drinking dirty water, the vast majority of the time it's not because of industrial pollutants clouding the water. It's feces. Human feces. When I saw the Borat movie, I laughed at parts, but thought the bit with him defecating in a plastic bag was too over the top. Come on - who doesn't know how to use a toilet?! Then I read The Big Necessity: The Unmentionable World of Human Waste and Why it Matters by Rose George. Lots of people, a good 40% of the world, don't have access to toilets, and many have never seen one. And the crisis of water-borne diseases spreading, and babies dying of dehydration isn't primarily about drought or environmental catastrophes. It's about people not having adequate sanitation. The water crisis is really a poop crisis. And the plastic bag scene? They're called helicopter toilets. In some places people really do use a plastic bag, then throw it up on the roof. At the very least it keeps the streets clean right? Four in ten people in the world have no access to any type of toilet, bucket or box. They are open defecators. They live surrounded by human excrement that gets brought into the house on their feet, fingers or clothes. (2) A toilet isn't a right; it's a privilege. A huge privilege. Sewer systems in large cities are stymied by oil and fats poured down drains, and by garbage flushed down toilets or dropped down the sewer grates in the streets: cellphones, Q-tips, pads, goldfish, etc. Flushing with water means we increase the gallons of waste flushed by twenty times. (19-21) At our cabin we use a composting toilet - the waste product goes under the trees deep in the bush, not on the garden or anywhere near a water source. The toilet uses no water at all. When you think about it, it's kind of insane to use drinking water to flush the toilets. We got the bottom of the line model, and I highly recommend it. Many people are getting involved in this crisis including Matt Damon (NGO H2O), Jay-Z, Chris Martin... "Globally, if universal sanitation were achieved by 2015, it would cost $95 billion, but it would save $660 billion." (72) One toilet for the few people on NASA's space shuttles costs over $20 million. (225) Unfortunately, sanitation wasn't part of the Millennium Development Goals. It's still seen as less vital than malaria and AIDS aid even though it kills far more people. By 2050, half of all people will live in countries that are chronically short of water. Yet we waste it so carelessly all the time. In times of drought, people stop flushing toilets unless absolutely necessary. "In a drought context, darker yellow pee in toilets signifies moral rectitude." (236) People can get used to anything.